When I enter the classroom at the Institute for Intercultural Studies in Bangalore, India, silence befalls the room and the PhD students stand to their feet. Intending the utmost respect, one of the students takes my computer case and walks it to the professor’s desk. Others await my instructions to take their seats. 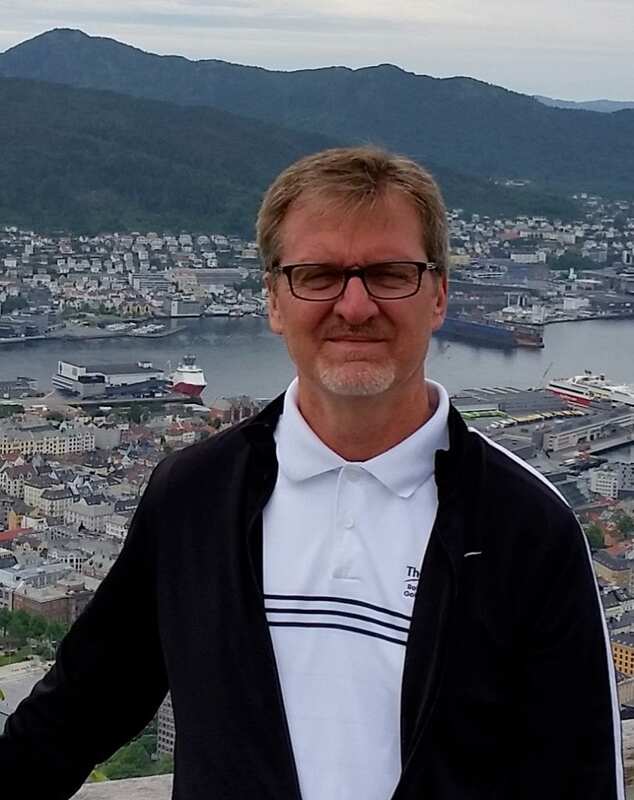 I also am a Lead Faculty in the Anderson College of Business at Regis University in Denver, Colorado. When I enter the classroom in Denver, nothing happens in relationship to me. The students continue talking with each other and I carry my own computer case to the facilitator’s table. Two distant and different geographic locations. Two dramatically different groups of people. Two “normal” sets of behavior. Two overall cultures. 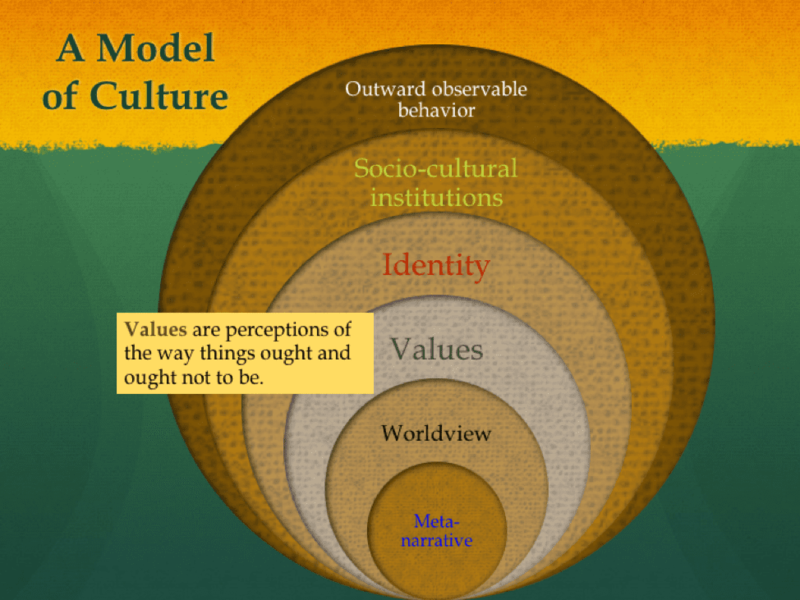 Each culture has its accompanying behaviors, institutions, identity markers, values, and core worldview assumptions. These are derived from a local story. 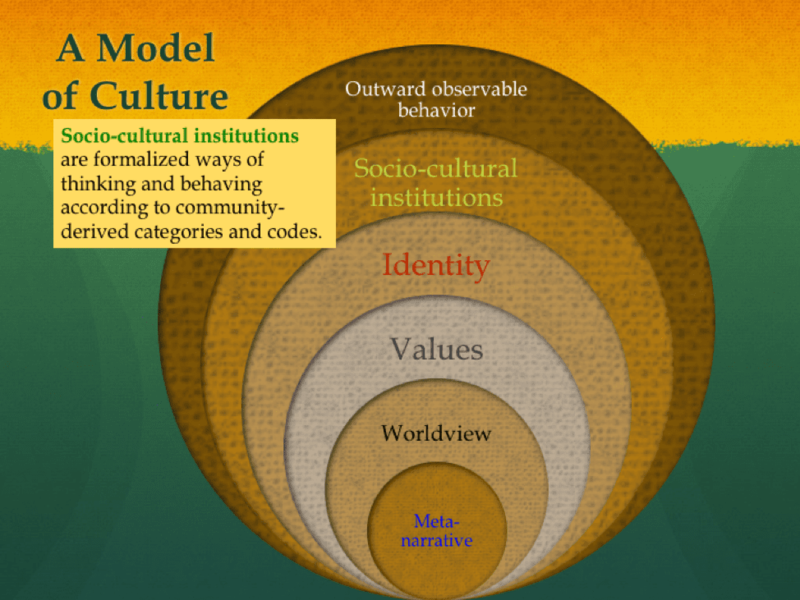 All the elements just listed make up a general model of culture. 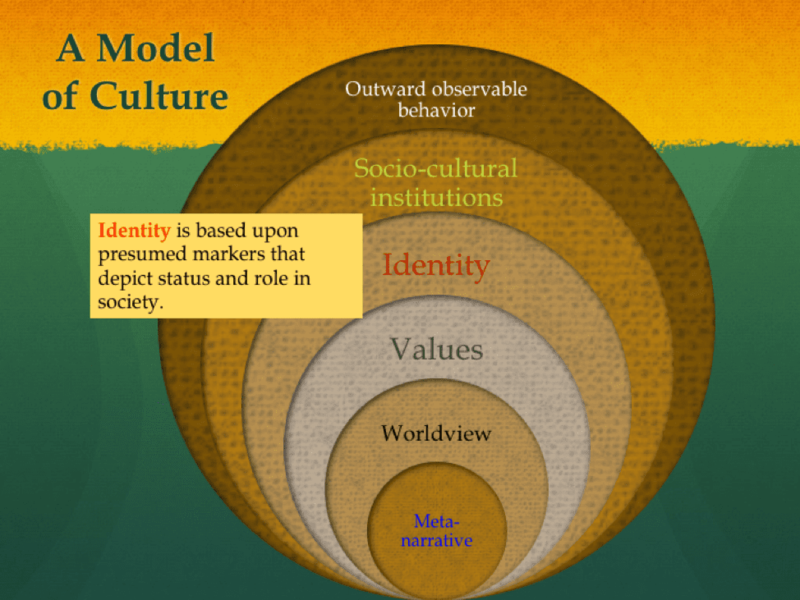 In the images that follow, each element or layer in the model of culture is briefly explained. The expanded model of culture starts with a big picture story . . . a metanarrative. The common story in Bangalore, India, frequently shared and widely known, includes the status and role of “gurus”. Henceforth, common sense says that commonplace behavior is to treat professors with absolute respect within communities of education and beyond. 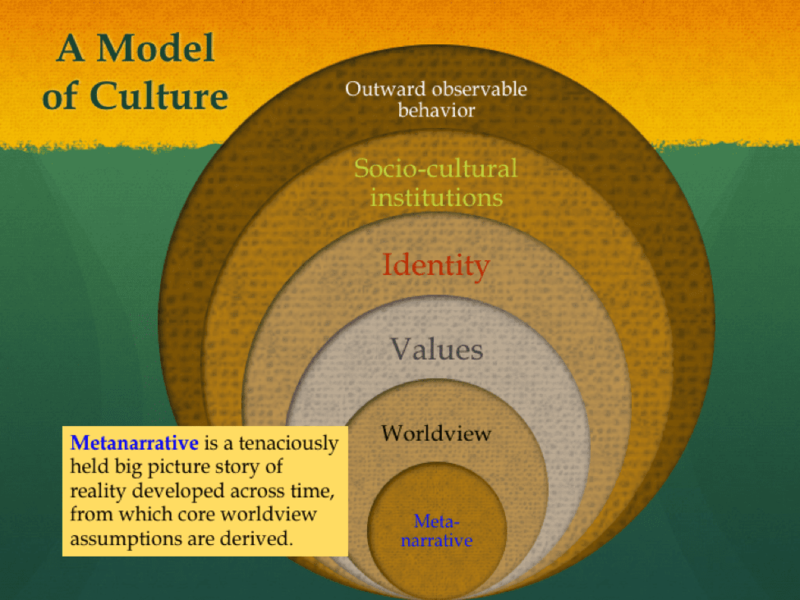 Any outward observable behavior in all societies has an expanded layer of culture beneath it . . . likely hidden from plain view but tacitly assumed. 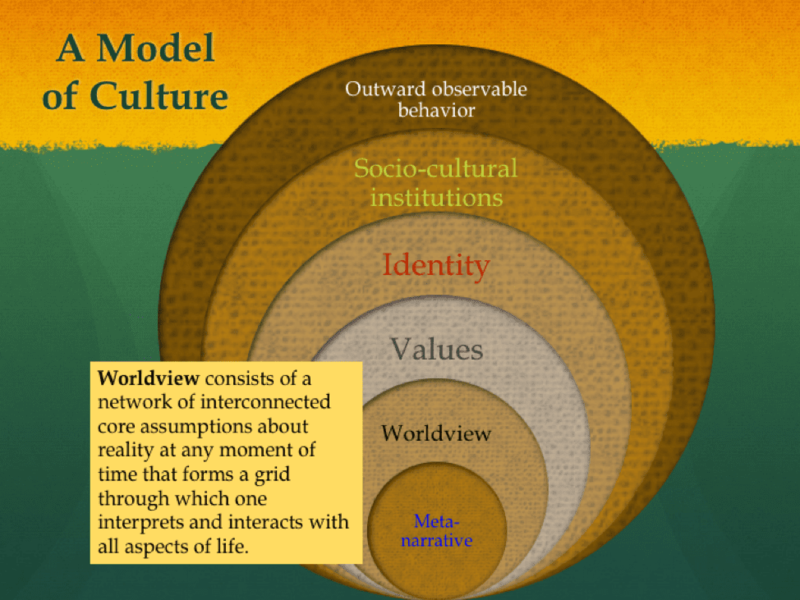 Global Perspectives Consulting provides training related to the layers of culture – what they are and how they work together. With general insights about how cultures work, one is able to predict behavior in cross-cultural settings and increase effectiveness in communication and performance.